I’m not a huge fan of glitter in makeup most days, but every so often a product will catch my eye on a shelf and I get mesmerized by the sparkle. 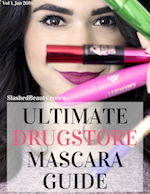 That’s exactly what happened when I saw the new Too Faced Twinkle Twinkle Liquid Glitter Eyeshadow on display at Ulta Beauty with the rest of the new Tutti Frutti collection. I decided to pick up a tube in “Sweet Spot,” which was a champagne liquid eyeshadow with gold glitter throughout the formula. I couldn’t wait to test it out, thinking it would be perfect for adding glitter to looks without the mess of fallout. But literally on the same shopping trip, I came across a new NYX display featuring the Glitter Goals Liquid Eyeshadow! This looked to be a similar product, but of course at less than half the price– $22 vs. $7.99. I decided to pick up the champagne shade “Polished Pin Up” to do a little dupe snooping. Both the Twinkle Twinkle eyeshadow and Glitter Goals eyeshadow feature a flat soft applicator that has a rounded top. The NYX applicator seems to pick up a little more product from the tube in one dip, but other than that and the length of the wand, there are no major differences in application. 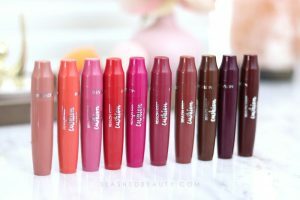 They’re designed to be applied straight from the tube, but there’s definitely nothing stopping you from loading the product onto a brush and applying that way. 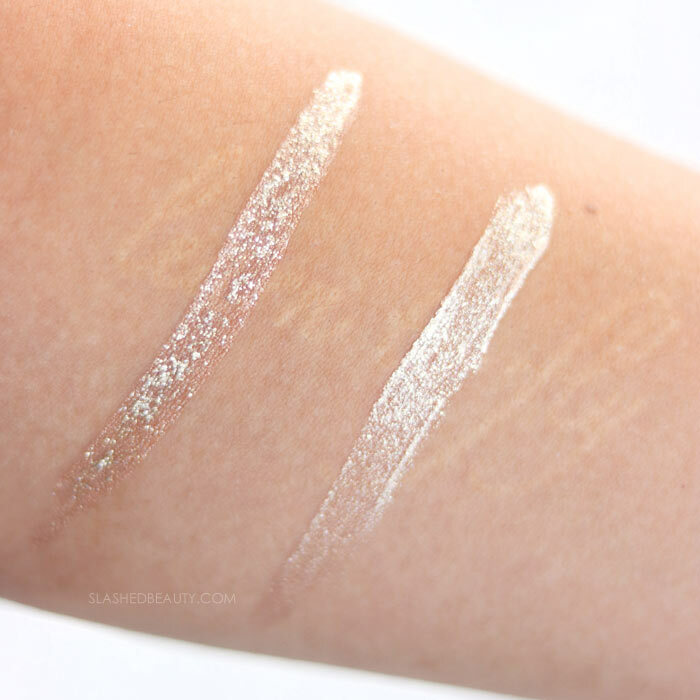 When swatched, you start seeing— and feeling— differences right away. “Sweet Spot” from Too Faced is a bit of a darker and warmer champagne, whereas “Polished Pin Up” from NYX is a little frostier. In the Too Faced shadow, there are chunky gold glitter particles among a pretty pigmented shimmery champagne base that helps fill in the space. On the other hand, the Glitter Goals shadow relies more on the fine glitter to make the statement, and it seems like theres a lot more of it in the formula. Swatched on the arm, you can see that the NYX shadow looks a bit more opaque and reflective due to the amount of glitter and how tightly packed it is within the liquid eyeshadow. 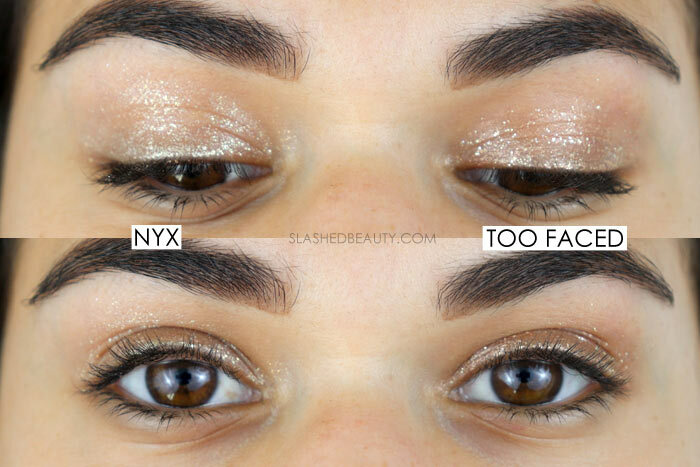 The NYX Glitter Goals shadow has more of a creamy consistency whereas Too Faced’s Twinkle Twinkle is a bit thinner. Even though that sounds like a lot of differences, when you actually apply these to the eyes the outcome is very similar. Above I’ve applied the shadows all over the lid, blending upward with my finger to soften the edges. An untrained eye would probably assume that I’m wearing the same product on both eyes— only a closer look shows that one has obviously larger glitter particles. I love how they look worn like this, as an all-over-lid shade that makes a statement on its own. I did find the NYX Glitter Goals shadow to be a bit easier to blend out, though, since the glitter was finer so the edges appeared more diffused. 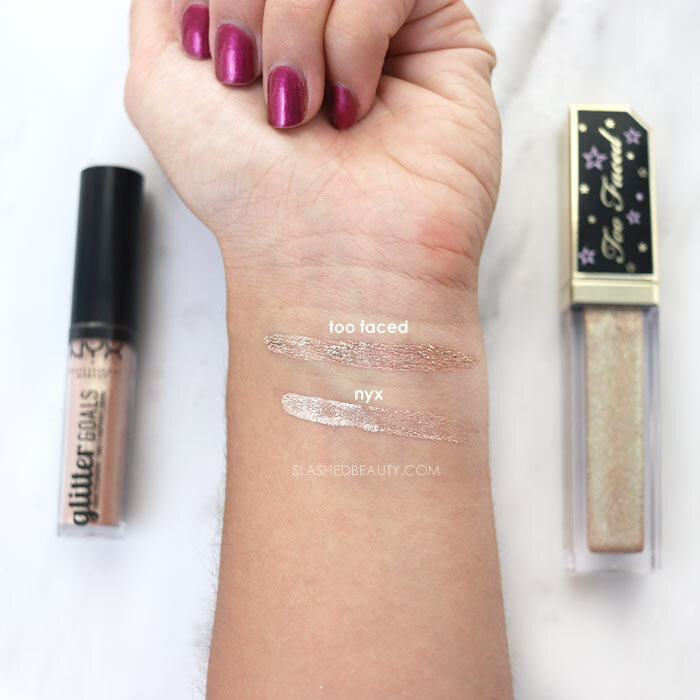 Both of these glitter liquid eyeshadows are long-lasting. Once they dry down, they won’t smudge or fall into your creases. Even when rubbing the eyes, only a few glitter particles come off with each formula. Perfect for a little glam that will last all day. Even though they have some major differences, I would consider these a dupe because the end result when applied to the eye is almost indistinguishable if you didn’t know what to look for. The NYX Glitter Goals shadow definitely does the trick and still performs just as well for a fraction of the cost. However, I’ve only put these specific shades side-by-side, so I’m not sure how other shade comparisons would match up. 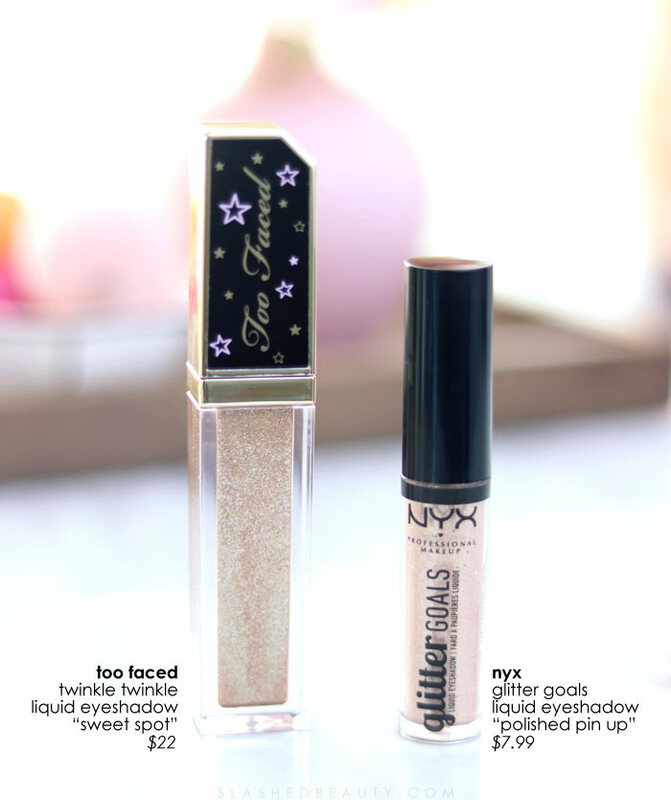 And if there’s a shade in the Too Faced Twinkle Twinkle Liquid Glitter Eyeshadow that doesn’t have a match in the NYX collection, I think it’s definitely worth picking up while they’re still available. Do you prefer one over the other? Do you think the NYX shadow makes a good dupe? 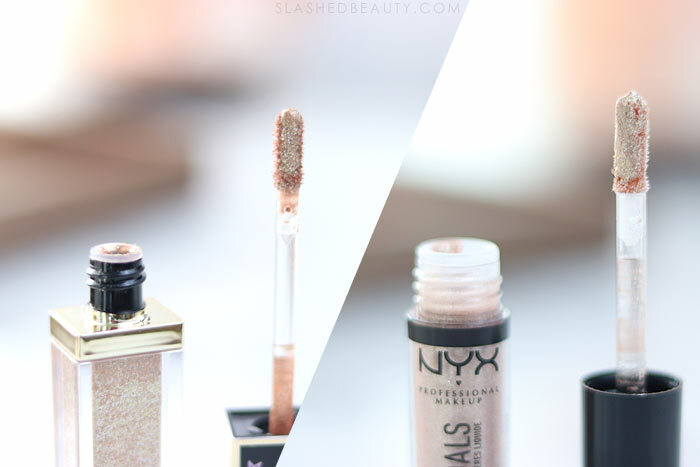 I’m curious now, how does the NYX stack up against the original Stila Glitter and Glow shadows? I wouldn’t know 🙁 I haven’t tried those!